I was wondering, if I were to run around in a world like this, how much I would need from one corner of Skyrim to the other far diagonal corner end to the other in kilometers/miles. There is already a study on large game worlds, but a bit outdated. It mentions Oblivion there, so it might be a reference point. How large is the world of Skyrim in real life? Is there a reliable method, theoretical or empirical, to measure it? Skyrim's heightmap is rectangular and uses 119 x 94 = 11186 in-game "cells". The engine uses the same cell size as in Oblivion, Fallout 3 and Fallout: New Vegas - 57.6 metres (63 yards) to the side, 3317.76 m² (3 969 square yards) of area. The full map thus has an area of about 37.1 km² (14.3 square miles). Around a quarter of this is not playable, stuck behind invisible borders. The playable area is roughly the same as the one in Morrowind and Oblivion and less than one thousandths of Daggerfall's size. In addition, the game features a good part of the surrounding area of Tamriel as low-quality "fake" terrain meshes. 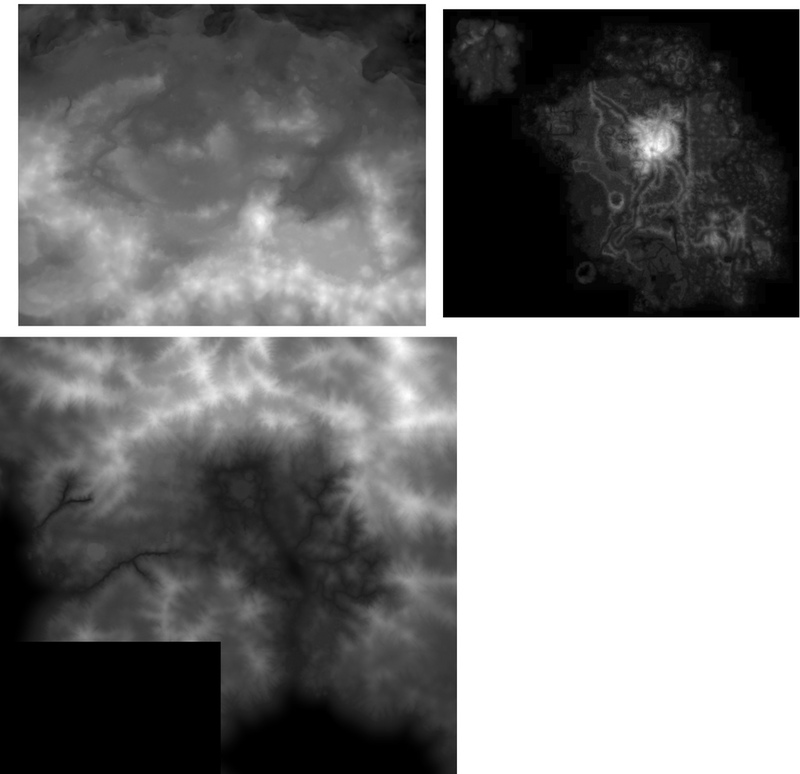 For comparison, the heightmaps of Skyrim (upper left corner), Morrowind (upper right corner) and Oblivion (lower left corner) look as follows, to scale (courtesy of Lightwave from Bethesda's forums). Most of Oblivion's heightmap is not playable, while most of Skyrim's and all of Morrowind's map can be visited in game. If it were a real map, or everyone had the same size screen and resolution, it would be easy enough to eyeball the distance between the above mentioned cities, and call that 110 miles. Although your results may vary, I can guestimate that the longitudal distance of Skyrim is about 400-600 miles, and the latitudinal distance about 800-1000 miles. So, just as a rough estimate, the province would be somewhere between 320,000 miles, squared and 600,000 miles, squared. For comparison, if we split it in the middle, Skyrim is about the size of Alaska. Well, if you take Blackreach into account, Skyrim is a tad larger than either Morrowind or Oblivion, seeing as Blackreach itself is about the size of a single hold, if not even larger. Is a horse actually faster than running? Is pickpocketing large amounts of gold in Skyrim bugged? How to highlight interactable objects in Skyrim? How to play a mage in Skyrim? How do Trainers work in Skyrim? How many quest followers could one gather at once? How is armor in skyrim classified? How to disarm punch in skyrim? How do I find Bran in Skyrim?